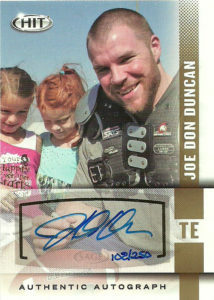 Joe Don Duncan went to school at tiny Dixie State finishing second in school history with 1,994 yards. He was an intriguing prospect to scouts, but bad timing (broke his foot before the Senior Bowl) did not allow them to validate his standing against his larger school peers. An intelligent receiver who has a natural knack to find the soft spot in a defense to sit in and make the catch, Duncan was quite an athlete and could be counted on to be a kicker and a long snapper if needed in a pinch. Joe Don was not selected in the 2014 NFL draft. In fact it wasn’t until 2015 that he was signed as a free agent by the Denver Broncos where they kicked the tires on converting him to fullback/ H-back. Duncan surprisingly lost out in training camp to James Casey and was cut. He later had a tryout with the Patriots, but eventually ended up playing for the Brooklyn Bolts of the FXFL where he scored a TD on a run and also on an onside playing fullback. After the league folded Joe Don decided to hang up his cleats for good, but hopes to go into coaching in the near future.